Slay the lord of the nine hells! A cooperative boardgame where players must unite their forces to beat the game. If the right decisions are taken at the right moment, then you'll be able to taste the sweet taste of victory. Otherwise, you all lose! You play the part of a Taoist monk with supernatural powers. Your final goal: vanquish WU-FENG, the wicked Lord of Darkness. In GHOST STORIES, the forces of good won't get a break – the ghosts will attack you unceasingly. 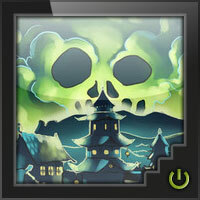 You'll have to team up to repel the attack of the ghosts, zombies and other abominations under Wu-Feng's command. You can defeat them through sheer strength or by calling upon Taoist magic. Don't hesitate to call upon the skills of the villagers you are protecting. The WITCH will help you exorcise a ghost but there will be a price to pay. The PRIESTS will pray in order to help you with some of your battles. The HERBALIST will help you find new ingredients for your spells. Be stronger and more clever than Evil and the village will be saved. Will you be brave enough to vanquish Wu-Feng and his minions? ± 30 minutes per game. A customizable board and multiple powers. Never play the same game twice, the game is always fun! If you like the physical board game version of ghost stories, there’s a good chance you’ll like this version as well. The graphics, sound effects, etc. are great, and the app runs smoothly. 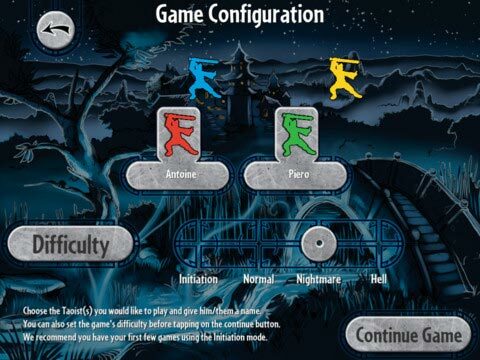 As with the physical version, you can choose from four modes of game play (initiation, normal, nightmare, and ****). You also choose whether to play with 1-4 monks. I prefer to play with 1 monk, but I also haven’t tried playing with more, so my opinion could change if I ever decide to try more. As with the board game, it’s a very hard game, but it’s a fun challenge anyway. Since I already played the board game before trying the app, I can’t really say how easy/hard it is to learn from the app provided instructions, but I did look over them, and they’re very similar to the board version. Since I already had a decent grasp on how the game works, it wasn’t an issue for me personally, but I do prefer when digital games have tutorials (which this app does not have) along with the written instructions. While playing, it does have your current action choices listed on the left side, which is helpful for newer players. On its own, I think this is a good game to play when you want a challenge. If you’re in the mood for something easy and relaxing, then you should try something else. If you have the board version, this version can be helpful as well to clear up some of the instructions or reinforce certain rules that aren’t as clear in the rule book or that you missed/forgot. I definitely learned a few things I hadn’t noticed before the first few times I played with the app! I had heard a lot about this game; about how difficult it was, how unforgiving, how utterly addictive. And, after about ten tries, I have totally and completely given up playing this thing. And not just the iOS, but the board game (which a friend owns) as well. Basically, you are one of four monks assigned to try and defeat a big bad ****** man whose ancient evil is trying to return to wreak havoc on the Chinese world via a small village somewhere on the other side of the Great Wall. Or something like that. Doesn’t matter. You’re moving around on a 3 x 3 grid trying desperately to get rid of or slow down the ghostly attacks that never seem to quit. On each space of this 3 x 3 grid are a set of convoluted symbols that I have yet to fully figure out, but that give special powers to the monks. Then there are special symbols on the ghosts, some of which signify the ghost is going to come and take over one of the squares, then another, then a third (at which time you’ll lose the game) unless you send it back to its host ghost or rid the row of said host ghost (I just like typing that! Host Ghost!) Anyway…..
After playing it on the iOS, I tried my hand at my friend’s physical game and guess what….it was worse! I thought the iOS rules were long and convoluted. The physical book was yet one more study in frustration. Yes, it’s a challenge. A massive, frustrating challenge. It’s a challenge to figure out all the symbols. It’s a challenge to figure out all the special powers. It’s a challenge to figure out how to last longer than four rounds (which is my record so far). 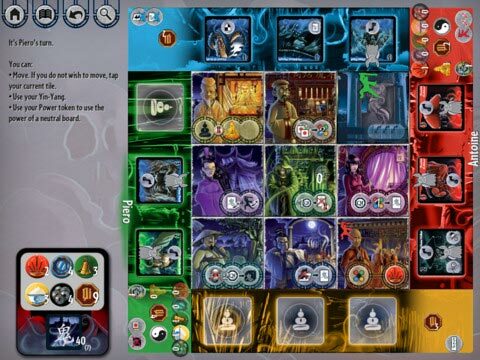 I have played Fantasy Flight’s Elder Sign and, while that’s tough, it makes sense and can be beaten. Ghost Stories, to me, is only frustrating and so demonically evil that I really have no interest in ever opening this app again. Ghost Stories is a very difficult cooperative game where players control Chinese monks as they defend a village against an onslaught of ghostly invaders. The iPad version captures the beauty of the visuals as well as the tension of the gameplay, so if you like the board game, you’ll love this. Like the board game, you can play with one to four players. I personally play it as a solitaire game (I don’t really care for co-op games with other players) and control all four characters myself. That way my monks always help each other out without me commanding someone else to make the move I want. For more detail about the gameplay, check out this review of the board game. I usually try to think of pros and cons for reviews, but I honestly can’t think of anything negative to say about this app. The visuals are excellent. The interface is intuitive and easy to navigate. And the game in general is just plain good. If you don’t mind a challenge, I highly recommend it. Picked up the ios version because i heard great things about the game, couldn’t find the physical version. The tutorial, while lengthy, is confusing. I know that a good game is buried in here, but i can’t seem to reach it. Also, though it is supposed to be 4 player co-op, you are limited to two players, which is a bit of a let down. Might be better if you have played the physical version and are looking to play on the train/plane. La terreur et la crainte règnent depuis des centaines d’années sur un village de l’Empire du Millieu. L’urne contenant les cendres du Wu-Feng, un esprit diabolique aux pouvoirs sans limite, a été cachée dans un coin sûr du village, loin des regards. Depuis l’Au-delà, Wu-Feng a réussi à localiser l’emplacement de cette urne. L’ombre de son incarnation, accompagnée d’hordes de créatures maléfiques, tentera de s’en emparer! Les moines Taoïstes, gardiens du village, devront assurer la sécurité de tous. Ghost Stories est un jeu coopératif d’Antoine Bauza pour 1 à 4 joueurs publié par Repos Production! Vous aurez ici à défendre le village contre des vagues de fantômes et à survivre assez longtemps pour dégommer l’incarnation du Wu-Feng! Selon la légende, avec ses plusieurs niveaux de difficulté ce jeu serait TRÈS difficile à vaincre… qu’en pensez-vous? Je vous invite à visionner les vidéos ci-dessous et à me partager vos expériences de jeu!! Add a Review for "Ghost Stories"